HAPPY VALLEY Shillong. 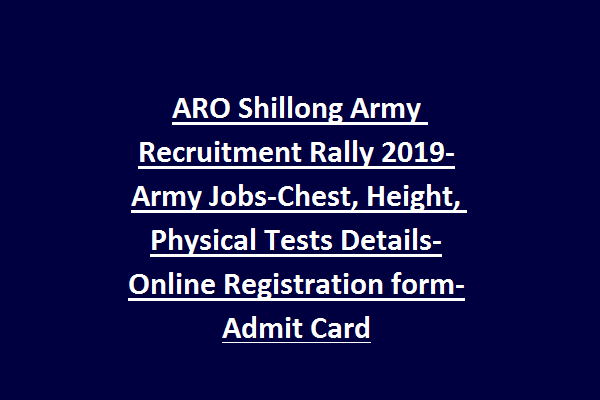 Online registration form submission last date for this ARO Shillong Recruitment Rally is 16-4-2019. Admit cards will be send to candidates registered email from 17-04-2019 to 01-05-2019. Shillong Army recruitment rally will be held from 02-05-2019 to 07-05-2019. Age limits, qualification, physical tests, chest, height, online application form, admit card available dates and other information for this Shillong Army Recruitment Rally will be updated here. For Soldier Tradesman 8th pass and for Soldier GD 10th pass and for all other posts 12th pass candidates are eligible. For Soldier GD Posts 17 ½ to 21 years and for all other posts 17 ½ to 23 years. For all the posts weight is 48 kgs. 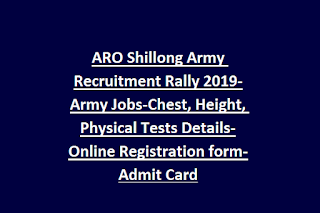 Admit card for this Shillong army rally will be send to email by Indian Army through email from 17-04-2019 to 01-05-2019. Apply online for this ARO Shillong rally on or before 16-05-2019. It is mandatory to register online for attending the rally AT ASSAM REGIMENTAL CENTRE, HAPPY VALLEY Shillong.